Your guide to parties, brewery bashes, kegs-and-eggs, and more. Four leaf clovers and beehives deck the walls of Publin, the second concept in Drink Company’s Cherry Blossom PUB. Photograph by Nick Karlin. Shaw’s pop-up Irish pub adjoining the Cherry Blossom bar is a festive place to sip for St. Patrick’s Day and beyond (it runs through March 21). The space is surrounded by nearly two hundred oversized four-leaf clovers and spring flowers. Cocktails include a real-deal Irish coffee with fresh whipped cream and there’re plenty of whiskeys and beers for sipping. Barrel’s Ruairi De Burca, a Cork native, wants to bring a taste of Ireland to the District this St Patrick’s Day. Starting Friday the general manager will host a celebration packed with food and drink specials such as $8 Irish drafts, lamb stew, and fish n’ chips. This atmospheric pub—with furnishings sourced from Ireland’s County Wicklow—celebrates with live music all weekend long. Catch evening shows on Friday and Saturday, and back-to-back performances on all day Sunday including sets from Britain’s DJ Q and District Dance Academy. It’s no surprise that the first Guinness brewery in the US in recent history is celebrating St. Patrick’s Day in style. 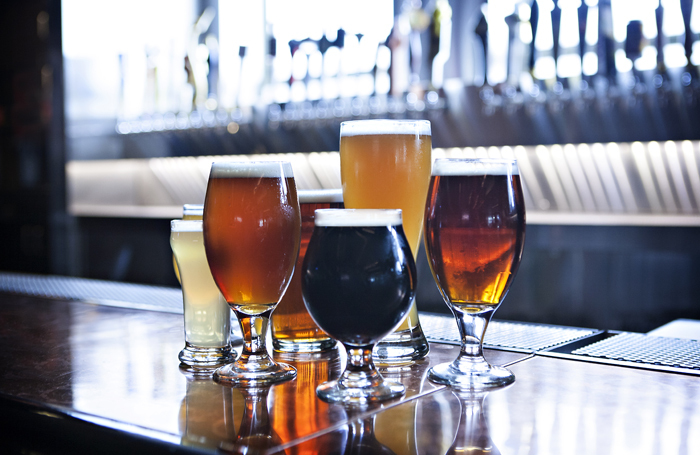 In addition to a month-long Irish tap takeover and special menu in the brewery’s restaurant, 1817, there’re ticketed events on Saturday and Sunday (21+ only). The $15 pass includes your first beer and some swag as well as access to a new Guinness food truck, special holiday menus, live music, and more. 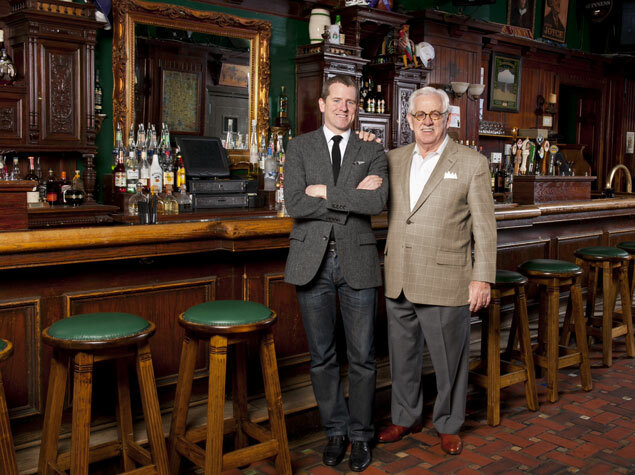 Gavin Coleman and his father, Danny, in the Dubliner, a Capitol Hill institution for 45 years. Photograph courtesy of the Dubliner. One of the oldest Irish pubs in the area goes all out for its 45th anniversary. On Saturday they’re hosting an all-day party with live music and dancing. On Sunday, festivities start at 9 AM with 45-cent Guinness beers for the first hour and two stages with bands. From 8 to 11 AM on Saturday this Chicago-based bar is hosting a “kegs & eggs” St. Patrick’s Day kickoff party with an unlimited breakfast buffet including scrambled eggs, bacon, pancakes and potatoes. Pair with a green beer, bloody Mary or mimosa. Penn Quarter’s longtime Irish pub will host live music at 3 and 9 PM on Saturday, and from 2 to 6 PM and 8 PM to 1 AM on Sunday. Catch local bands like the Muddy Crows and Lloyd Dobler Effect in action alongside food and drink specials. Penn Quarter’s British eatery is taking St. Patrick’s Day quite literally: Anyone named Patrick (and anyone with a Patrick) can get an assortment of Irish ciders and beers for $1 between 4 and 6 PM on Sunday. Hungry? Then stay for their dinner special: Brined corned beef, roasted cabbage, Irish soda bread. and more ($36). Capitol Hill’s Union Pub is ringing in St Patrick’s Day with a bang. On Sunday they’re offering $3 “Irish Slammers” with Irish whiskey and cream in a Donnybrook stout. They’re also offering buckets of beer for $16 a pop. Weekend menu items at these beer bars include fish n’ chips, an Irish breakfast platter, and bread pudding. Lucky diners with shamrock stickers under their beer glasses will receive a free drink voucher. Get their early on Sunday to score a free etched glass with your Guinness order. The bar at this Irish-owned Dupont Circle Hotel offers a whisky tasting “tour” across different regions of Ireland, while the restaurant will focus on Irish wines (yes, that’s a thing) and food. What better way to wrap up St. Patrick’s Day 2019 than the biggest celebration in the country? On March 23rd, Shamrock Fest returns to the District with tons of music, carnival rides, Guinness, Jameson, and even ponies! This year’s lineup of bands and DJs includes The Mighty Mighty Bosstones and James Kennedy from Vanderpump rules. Ticket prices range from $29.99 to $280.